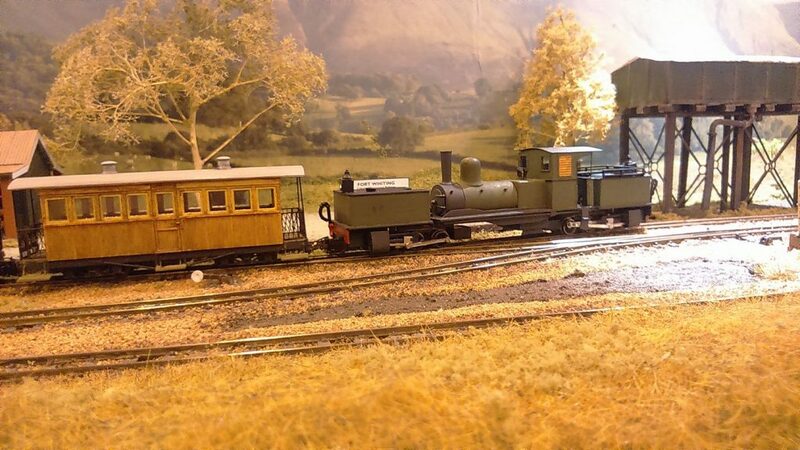 Nineteen layouts were booked to attend in 2018 in a total of twelve different scale/gauge combinations and covering the period from 1880 to 2018. Addison Park shows an imaginary location in West London very close to Addison Road (now Olympia) station. It assumes that an original single track line from Ealing was built in 1872 which was taken over by the Metropolitan Railway in 1892 and then incorporated into the London Passenger Transport Board in 1933. It supposes that in the 1936 LPTB modernisation plans the site was chosen as the terminus of both the new electric District Line from Hounslow and the Piccadilly Line from South Harrow. The new terminus was incorporated into a larger project between LPTB and the developers incorporating shops, houses and offices, similar to that actually built at Park Royal. The Ealing branch, now extended to Uxbridge, was electrified and incorporated into the new station. The rolling stock is a variety of surface and tube stock from the period and although trolleybuses are still operating along the High Street, London’s “Bus of the Future”, the Routemaster 1, has just arrived. 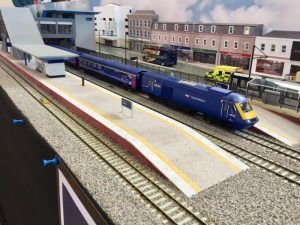 The model is built to 3mm scale with a track gauge of 14.2mm and although most of it has been scratchbuilt, many products from the 3mm Society’s vast range have been used. Set in rolling countryside somewhere in central England around 1965, Ambleton Vale is a fictitious terminus station at the end of a branch line connecting the village of Ambleton Vale with the county town some 20 miles away. It has survived in the face of the general decline in rail travel because of a flourishing livestock market on the outskirts of the village, and the nearby Ambleton Vale racecourse. The line was setup to facilitate the transportation of animals both at the main station, which is close to the market, and at a short siding which services the racecourse, but of course carries plenty of humans too! 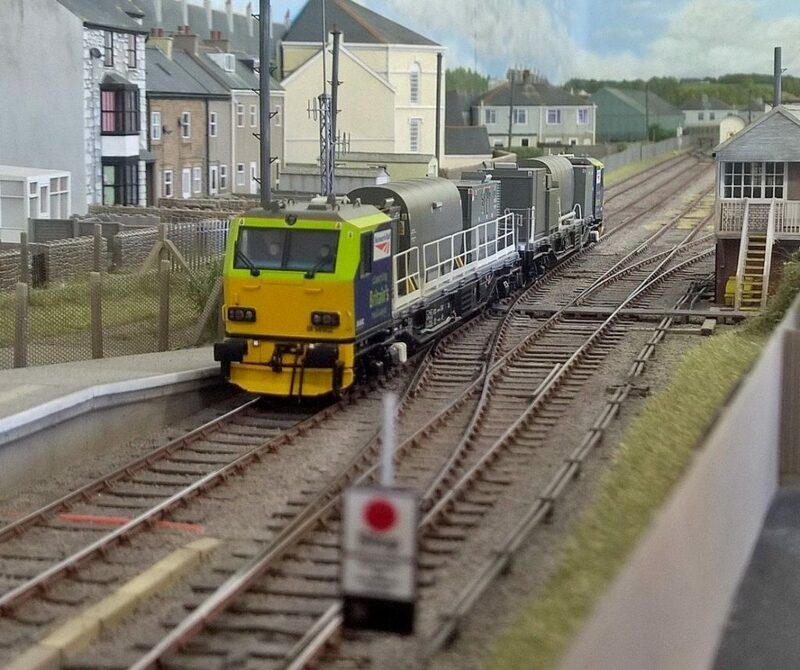 The station is busiest at weekends when the market is in progress but is also used during the week by commuters who find that rail travel makes it possible for them to have a quiet rural lifestyle away from their work in the city. Arcadia Pennsylvania is a front (and rear) operated, freelance, box-theatre style “time-saver” layout depicting a fictitious, small industrial railroad freight terminal set in Arcadia, Pennsylvania, Eastern USA; the freight terminal has, as part of its backcloth, the declining “Arcadia Steelworks” Blast Furnace, although they are not operationally related. 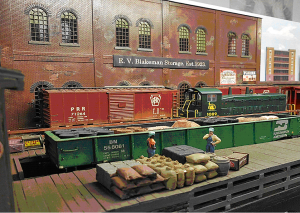 Rolling stock and architecture represents the period 1960’s to 1970’s and a short line (APT) serves the location – to handle box cars, flat wagons, gondolas, and tank cars for several local operations. Sometimes, the route is worked by other motive power and, as a result, stock can be seen to be worked by a Pennsylvania RR Alco RS-1, a Louisville & Nashville EMD SDP35. The freight yard’s resident locomotive is a leased Central Railroad of New Jersey EMD SW9 (to be branded APT). Freight traffic is generated using a 4-track traverser that is linked via a short tunnel into the freight servicing area. Points are controlled remotely, using Tortoise slow-action motors. Motive power is via three Atlas DCC sound-enabled locomotives and controlled using an expanded NCE PowerCab system; the layout also has a Lenz backup system. 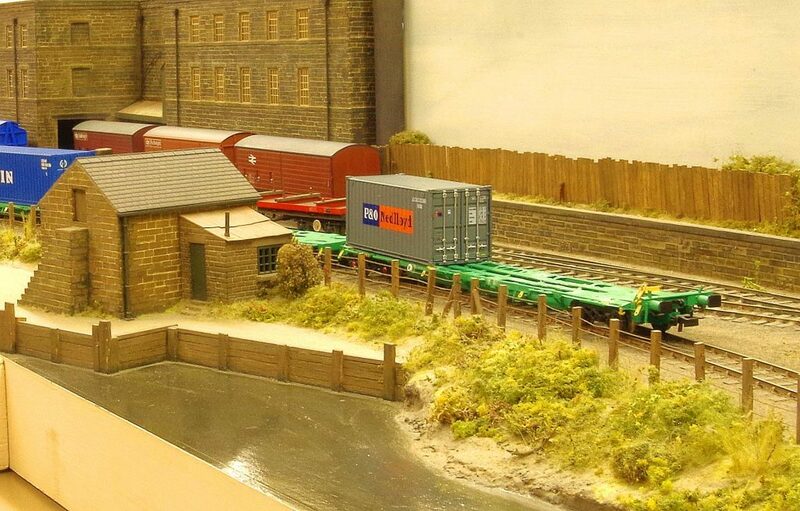 Arun Quay came about by the desire to build a small ‘0’ gauge layout that could easily be transported in a car. The resulting dimensions dictated that any thoughts of ‘main line’ running were out of the question and a shunting yard was the only real option available. Thought was also given to make everything as light as possible – what may be easy to handle now might feel quite a lot more awkward in ten years time! The scenario is a small quayside yard on the River Arun – near Littlehampton in West Sussex in the 1950s. It is fed by a line on the trackbed of an old tramway that, together with many of the facilities and workshops, dates back to the days of 19th century sailing craft. To improve the appearance of the track and generally help the running of wheels through crossings, the track gauge has been reduced from 32mm to 31.2mm. Arun Quay was featured in MRJ vol 260. We operate the layout from the front so please feel free to interrupt should you have any questions. Barton Road is the newest of the MMRS layouts, having been given its go-ahead in December 2015, and it is exhibited this year as a work in progress. It will be a modular layout, capable of being exhibited in a number of different configurations. It represents a large freight marshalling yard in an industrial area such as Trafford Park which has feeder lines from a wide variety of industries. The layout will feature radio controlled lorries and cranes, which it is hoped visitors to the show will be able to operate. 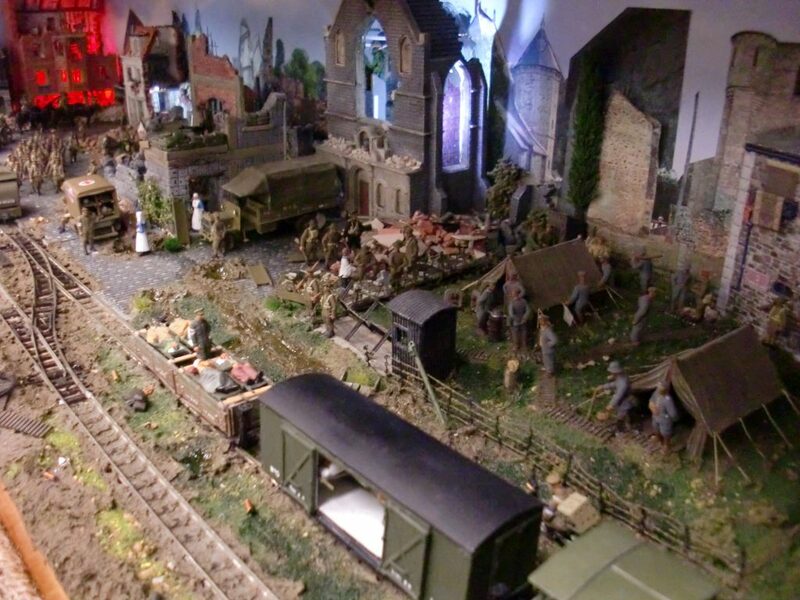 The layout is based on the British 60cm narrow gauge railway system which supported a wide range of services to the front line battle areas of northern France during the 1st. World War. The large concentrations of soldiers and artillery at the front lines required delivery of enormous quantities of food, ammunition and fortification construction materials where transportation facilities had been destroyed. The railways carried supplies of every kind, troops to and from the front, brought back salvage materials, transported artillery, wounded troops to receive medical treatment…. the list goes on. 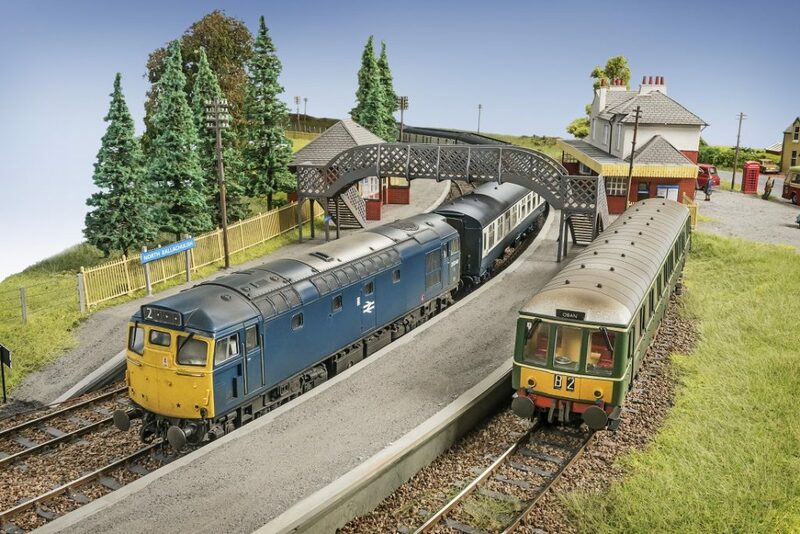 The display is based on several existing photographs of towns and villages which had single track running through them with spaced out passing loops at regular intervals. 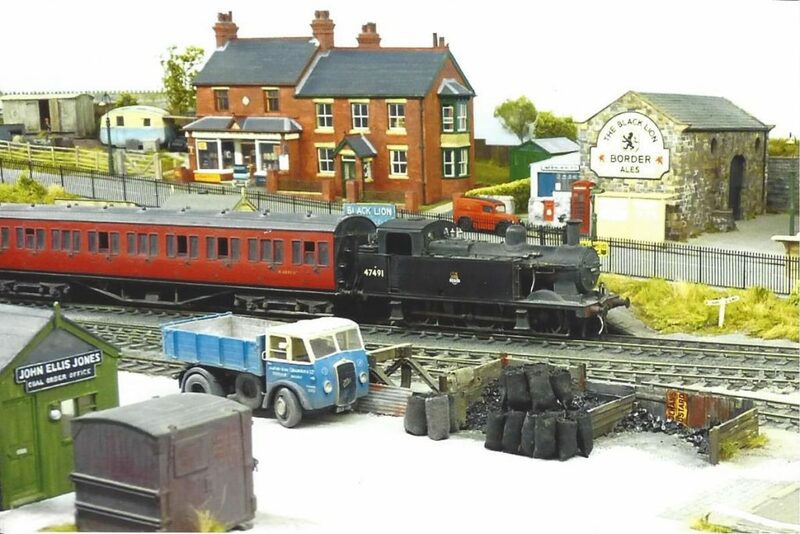 Both the layout and the loads carried display many of the scenes depicted in the photographs of the time. 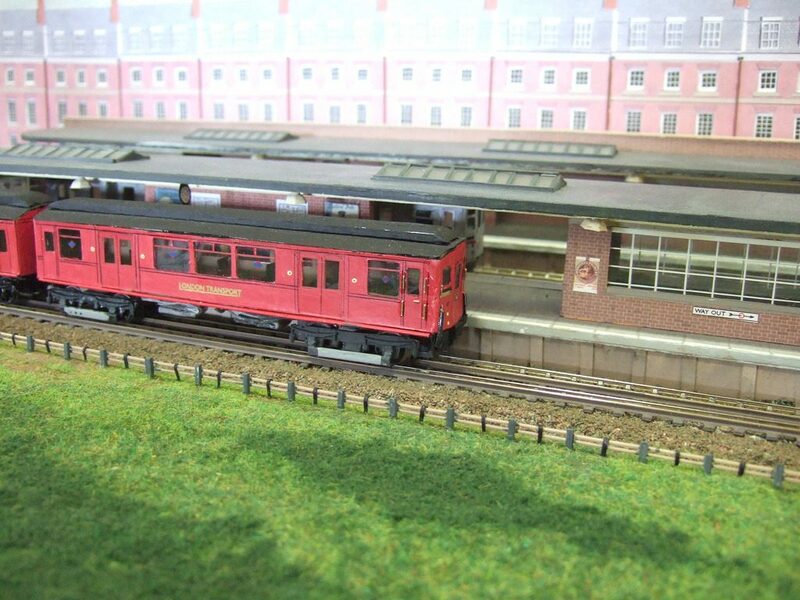 All the models, rolling stock and vignettes displayed on the layout have been fully and carefully researched. There are stories behind all you see. Our aim is to keep alive a part of the history of WW1 which is little known by most people, thus remembering those nameless soldiers who worked and died and without whom the army would never have been supplied. The layout represents a hypothetical bit of the small part of the LNER that reached Wales, namely the former Wrexham, Mold & Connah’s Quay Railway, later the Great Central, as it might have been in the mid fifties. By this time the railways in the area around Wrexham were a fascinating mixture of three of the Big Four, plus BR. The ex-LNER lines became part of the Midland Region after nationalisation, but GC and LNER locos continued to play a part in operations for a further ten years despite encroaching ex-GWR and ex-LMS motive power. Late in its life, the LNER’s Wrexham shed, Rhosddu, even finished up in the Western Region while still home to ex-LNER engines. The layout’s operation is primarily goods-orientated. There are active connections to a colliery, a brickworks and a limestone quarry, although little of this industry is directly modelled. 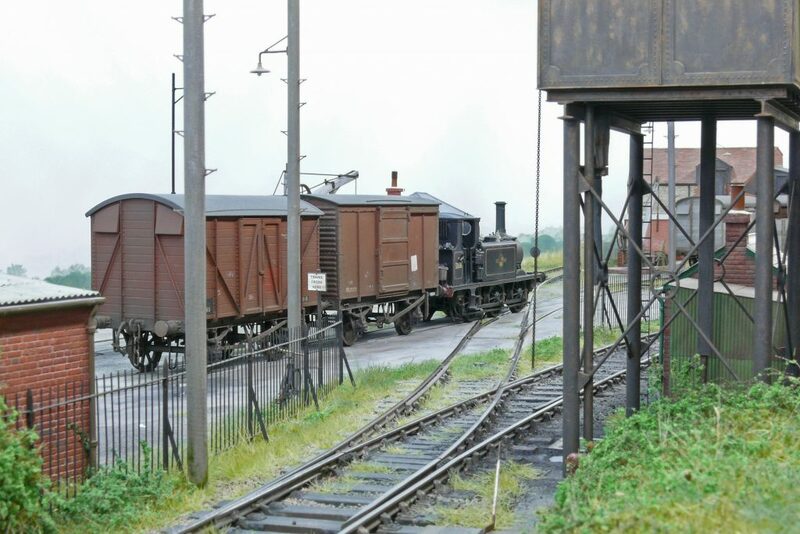 In addition, raw materials to, and products from, Brymbo Steelworks pass through Black Lion, thanks to an imagined connection to the Shrewsbury-Chester main line between Wrexham and Ruabon. Only an unadvertised workmen’s service and an occasional RCTS excursion interrupt the freight movements. 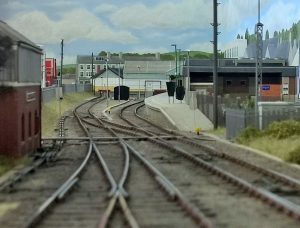 Deanmoor is a post-privatisation N gauge layout which was featured in Railway Modeller in May 2017 and has considerable local interest. It is based on the railways around Stockport where a single track ex-Midland Railway line through the Peak District serving a cement terminal crosses the West Coast Main Line. It features tensioned OHLE and is fully working signals. 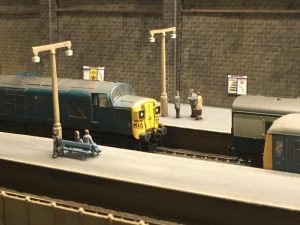 The layout won a prize in the N Gauge Society’s “Layout on a Door” competition. 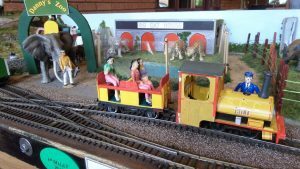 A layout for the children to operate, transporting the people and animals around the zoo! A second layout for the children to operate, but this one is more suited to the older children (or adults). The old goods yard at Dufton Road was converted into a diesel stabling point in the late 1960s. At the time depicted (the last days of British Rail) it is mainly used by locos pulling cross-country and parcels services. However, a variety of locos from excursion trains also use the depot. The layout is set on the fictional island of New Gelderland, several hundred miles east of South Africa. Originally a Dutch colony, the island was taken by the British in the 19th century and served as an important naval base until after the Second World War. In the early 20th century, a 2’6” gauge railway was built to connect the main port and town on the island, Port Canning, to other smaller towns on the island, including the small military base at Fort Whiting. Locomotives were provided by a number of British builders, including Hunslet, Kitson, Nasmyth-Wilson, as well as American builders such as Baldwin. In reality, the layout was built to run a collection of colonial-style 009 stock, and is based on the Mid Illovo branch on the South African 2ft gauge lines in Natal. Hallam Town is set somewhere in South Yorkshire, sometime in the 1970s. 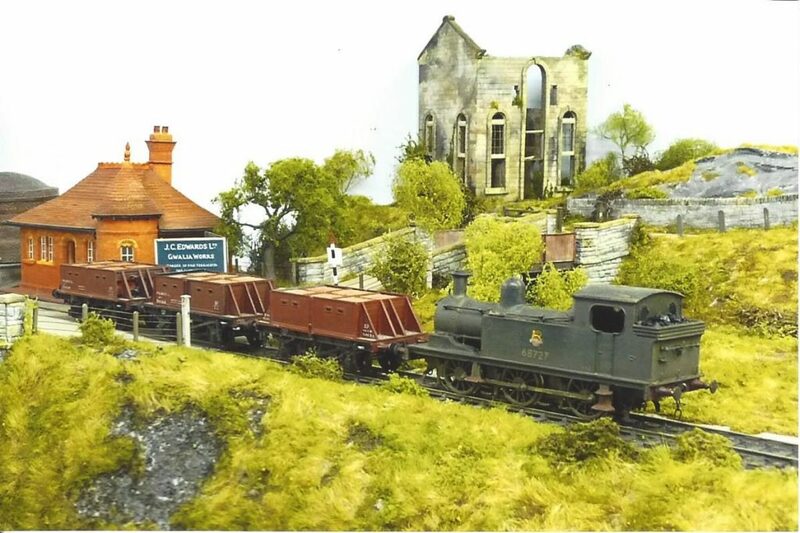 It began life as a challenge to build a 2mm Finescale model railway over a weekend. The classic ‘Minories’ design was chosen because it uses standard turnouts rather than custom-built pointwork. 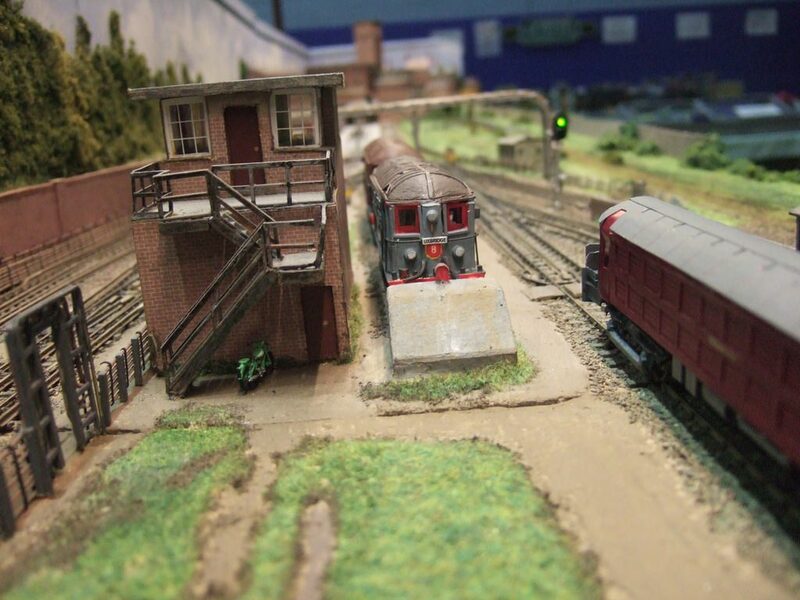 Track and points were built from the 2mm Scale Association Easitrac range. 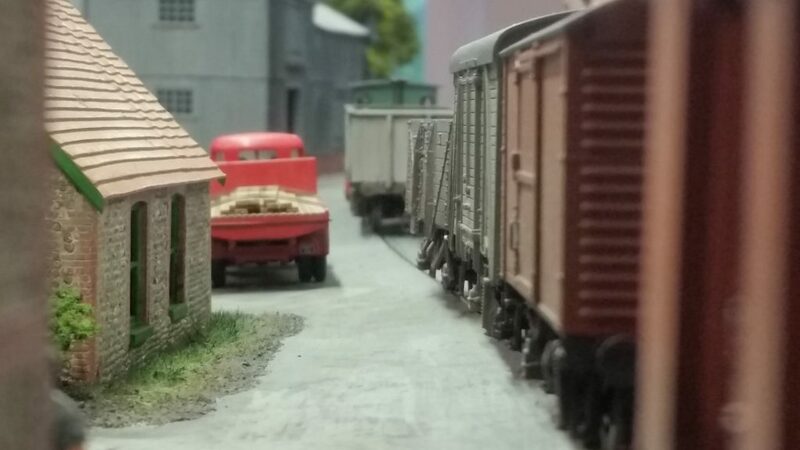 A traverser fiddle yard was added to save space and this give four storage roads. After the ‘track-and-bare-boards’ stage had been reached a decision was made to develop it into a scene from BR’s Corporate Blue era. So, it is mostly operated by DMUs, including the Class 101 and 108s that were such a part of South Yorkshire’s railway at the time. In addition a Class 123 Swindon Inter-City four-car unit was built for the layout as, in the mid-70s these sets were transferred to Hull to operate the trans-Pennine routes via Sheffield and Leeds and so were also a common sight. The short Pullman train is intended to suggest a portion of a larger train – the real Yorkshire Pullman ran as several portions to a variety of destinations over the course of its life. There is no place for freight on a layout such as this, but a small parcels dock was added to the original design to allow for an occasional parcels working. Although the layout is mostly DMU operated, locomotives do make a regular appearance, both on the Hallamshire Pullman, as station pilot and simply flitting on and off-scene between the loco siding and the fiddle yard. Locomotives shuttling around to no apparent purpose was another feature of BR in the 1970s! 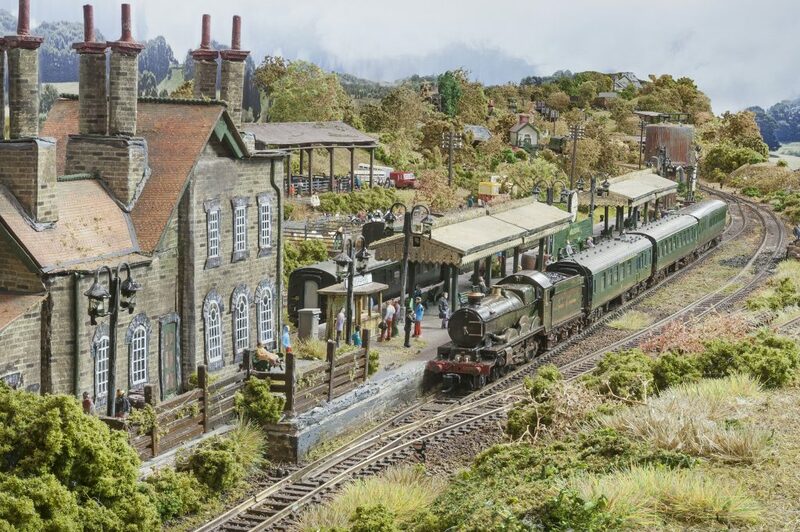 The overall aim is to demonstrate that building a finescale model railway need not be a lifetime achievement, but with the range of time-saving products now on the market, raising your game a little and going finescale – in whatever scale – is easier than it ever has been. Hounslow is in west London, near to Heathrow airport and Hounslow Sidings depicts a station on the Twickenham and Brentford loop from Waterloo in the 1950s. Hounslow Heath barracks are nearby and the station was used as a military vehicle loading point during WW2. The layout is viewed from the ends of terraced house gardens which back on to the railway. It is controlled by MERG DCC and the locos are mostly kit built. North Ballachulish, by Andy Cooper. Photographed for Model Rail[/caption]A version of what might have been built at the real village of North Ballachulish on the main A82 Glasgow – Fort William road at the point where it has crossed the Loch Leven narrows at Ballachulish Ferry and suddenly bends westwards to follow the shore of Loch Linnie. The Callander and Oban Railway had proposed to build a main line from Oban to Fort William, and then through the Great Glen Inverness. Taking advantage of the easier running over the north bank of Loch Leven a branch would have been made at North Ballachulish to enable goods workings to the Kinlochleven aluminium smelter. In reality of course the railway only got as far as Ballachulish and never crossed the narrows. Set in 1970/71, passenger and freight traffic is hauled by the ubiquitous 27s and 26s down from Inverness, and also goods workings to Kinlochleven (Presflos and Cov Hops from Burntisland) as well as a daily passenger working for the smelter workers. The station building is that of Kentallen on the Ballachulish branch, about 3 miles south of the village and the signal box a Caledonian Railway modified S4 box as used on the Ballachulish branch. The non-railway buildings are all from the village of North Ballachulish and most of them placed in the locations they are in reality. The topography is also pretty much as it is in reality. The point work is all hand built on ply sleepers using Exactoscale components – plain track is C and L. The signals use a mix of MSE and D&S components and operate via Hoffman motors. All structures are scratch built from styrene sheet. The layout itself is wired for both analogue and digital control, but at shows will predominantly use analogue for the ease of operators who rarely use DCC. The A82 is operational too, using the Faller car system. 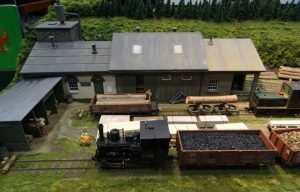 Oakhurst is a minimum space Scaleseven layout depicting the South Eastern Railway in the 1880s. It does not pretend to copy a prototype, but rather to offer, in a minimum space configuration, a moving picture of a long lost railway and social era in Kent. The layout has grown our of the need to dismantle and scrap my original, large “Oakhurst” layout, from which everything possible was saved and re-used here, down to the fencing and home made turnout operating units. 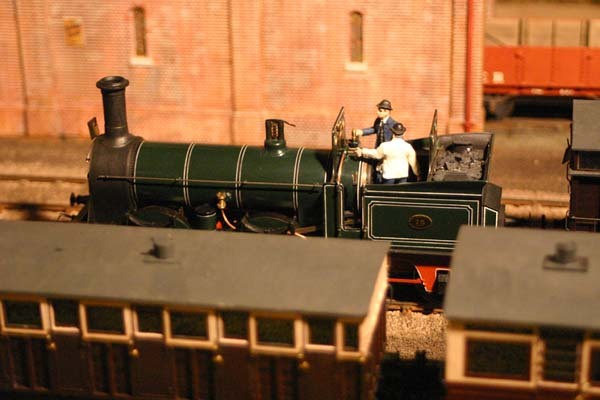 Much of what is on view is over twenty years old and most is scratch built, though some locos and rolling stock items are now available as kits!!! Operation is only possible with the use of spare locos, and neither the SER or any other railway would have built anything so compressed an difficult to work. Baseboards use insulating foam, points and signals are worked by servo power, and DCC is used for control. Questions are welcome. Situated in north-west corner of Wales, on the Llyn Peninsula, Pwllheli is the northern terminus of the Cambrian Coast Railway. Eight return workings a day traverse the coastal route to Machynlleth, with services continuing onward to Shrewsbury. The layout attempts to convey an impression of the station and its surrounding area as it appeared between 2000 – 2012 prior to ERTMS coming into operation, with a regular DMU passenger service, interspersed with an occasional heritage rail tour or engineers train. Buildings and associated details have been laser cut from MDF, Rowmark, etc using drawings created in AutoCAD. Where possible these drawings are based on actual plans obtained through Gwynedd Council or where these are unavailable from photographs or a Google street view survey. Locos and rolling stock are based on prototypes recorded as running on the Cambrian line during the period modelled. These are predominantly RTR models from Bachmann, Dapol, Heljan or Hornby, converted to P4 by replacing the wheels with either Black Beetles or the appropriate Alan Gibson conversion set. The layout is operated by DCC using NCE equipment Points are driven by ‘standard’ servos, controlled through an ESU switch pilot servo configured for analogue input. Readham came from the desire to have a modern image DCC sound layout where the locos weren’t just at a constant speed and ‘sound’ and it had to have 2 main design features – a station that would allow full size passenger trains and a tram running through the streets. The architectural influence was also important and the architecture of Cheltenham and the stunning modern Reading station have been the key influences. All of the buildings feature a high degree of detail and everything is scratch built from plastic sheet, plastic profile sections, brass rod, foam board, texture paper, spray and hand painted, and 3D Printed components. The station features 3 full length platforms and 1 bay platform. Readham is set in a semi fictional region that ‘allows’ the operation of FGW/GWR, Arriva Trains Wales, Cross Country and South West Trains. The station also sees a lot of freight movements, either straight through or held on platform 4 waiting for a path in between passenger operations. There is also the occasional ‘Diesel Special’ and a couple of kettles (Clan Line and Thomas Hardy) put in an appearance for steam specials. 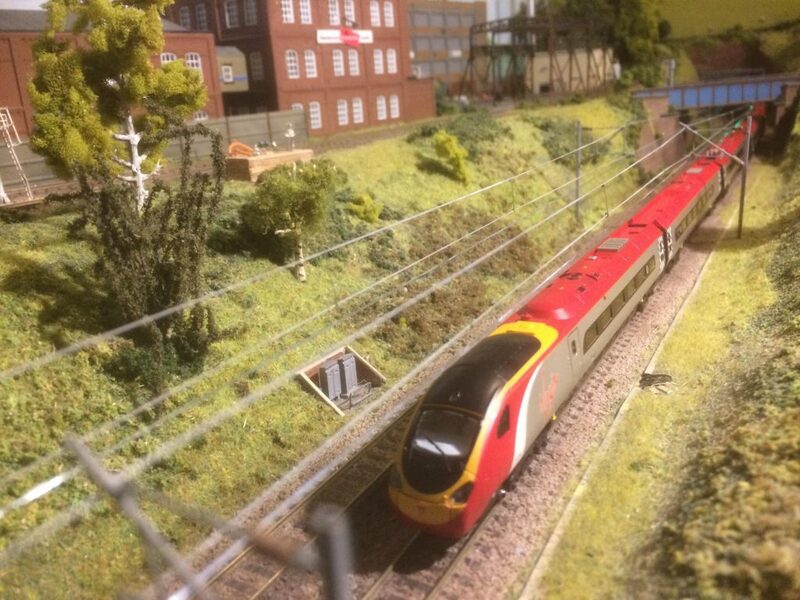 Our intention is to keep the station busy and our motto is “no timetable, just trains – a lot of them”. The small industrial yard at Tarring Neville is part of the Denton Cement works system. It is located just off the Seaford branch in the Ouse Valley, Sussex. The eclectic mix of buildings house fabricators and merchants associated with the cement works. 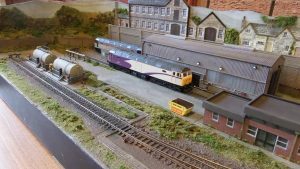 The yard is normally shunted by one of the Newhaven based Terriers although the odd Denton Cement works loco can be seen at work too. Zauberwaldbahn depicts a part of the narrow gauge network of lines which were built in the rural state of Brandenburg surrounding Berlin in the inter-war years. The last of these lines carried passengers in 1969 and closed 2 years after that, and the model is set in the early 1960s whilst the area was still part of East Germany.